Slabs of feta cheese simmered in a cumin-spiced tomato sauce may sound unconventional, but this simple dish makes a delicious vegetarian dinner. It’s Saturday…if you have friends coming over for dinner but you don’t feel like spending all day in the kitchen, I’ve got just the thing for you. This baked feta recipe comes from the book Cook90 by David Tamarkin, the editor and digital director of Epicurious. 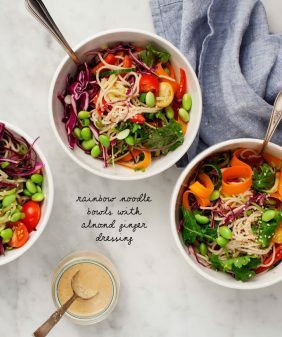 It’s a great book that’s full of accessible, easy-to-prepare dishes. Cook90 is essentially a guide to help you get in the habit of cooking by cooking for 90 days in a row. However, it isn’t a diet plan or a cleanse or anything like that. The idea is that if you’re someone who wants to cook more, this is sort of a jump start plan to get into the habit. 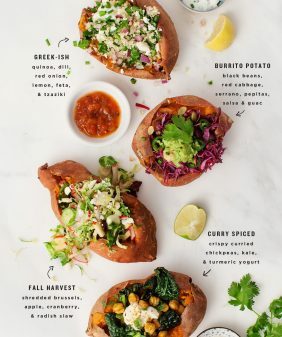 If you’re someone that eats a little bit of everything, this plan would be a great one to follow (the recipes are not all vegetarian). For everyone else (me included), there are a bunch of produce-forward recipes that are fun and fast to make, like this baked feta! 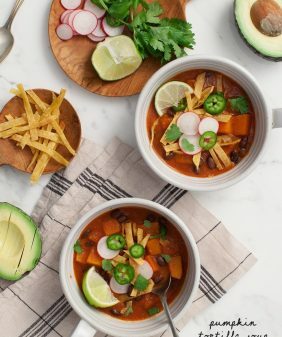 If you’re a fan of simple, comforting, and healthy food, give this recipe a try, and get more inspiration to stay in the habit of cooking from our recipe index! This recipe is adapted from Cook90 by David Tamarkin and is reprinted with permission. Heat a 10 or 12-inch oven-safe skillet over medium heat and add the oil. Add the cumin seeds and let them sizzle gently for a minute or two. Add the kale in batches, letting each handful shrink and wilt before adding the next. 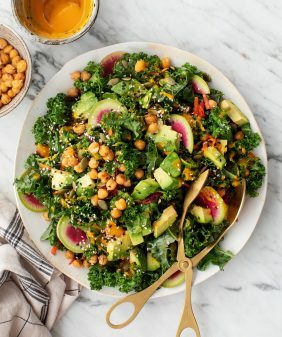 When the last of the kale has wilted, add the tomato sauce, chickpeas, lemon juice, and ½ cup water. Stir and let it come to a simmer. Nestle the feta slices into the sauce and sprinkle with freshly ground black pepper. Slide the skillet into the oven and bake until the feta has softened, about 15 minutes. Drizzle with olive oil and a pinch of red pepper flakes and serve with warm pita and lemon wedges. Note: the original recipe called for 3 cups tomato sauce, which I thought was too saucy, so I ended up using 2 in my final version. *If you use ground cumin, I recommend starting with ½ teaspoon and adding it in step 3 with the tomato sauce because it'll burn quicker than whole cumin seeds. 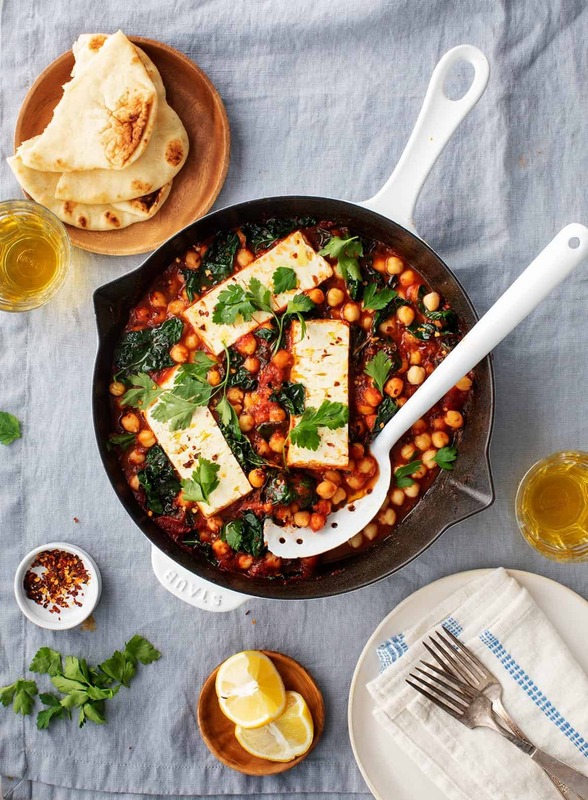 Can I substitute tofu for the feta to make it vegan? You could, it won’t have the same salty quality so I would season the whole dish a with a bit more salt and pepper than what’s written here. And I’d put 6 planks in the skillet to serve 3 people since tofu is lighter and less rich than feta. (so 2 tofu planks per person). I hope that helps! When I read the ingredients my mine went immediately to the block of sheeps’ milk feta in my freezer… Fortunately my husband will eat lacinato kale (he hates the curly kind). I’ll definitely have to try making this. Hi Susan, I hope you and your husband enjoy it! What else do you suggest to serve with this entree if you were having guest over? This sounds wonderful! 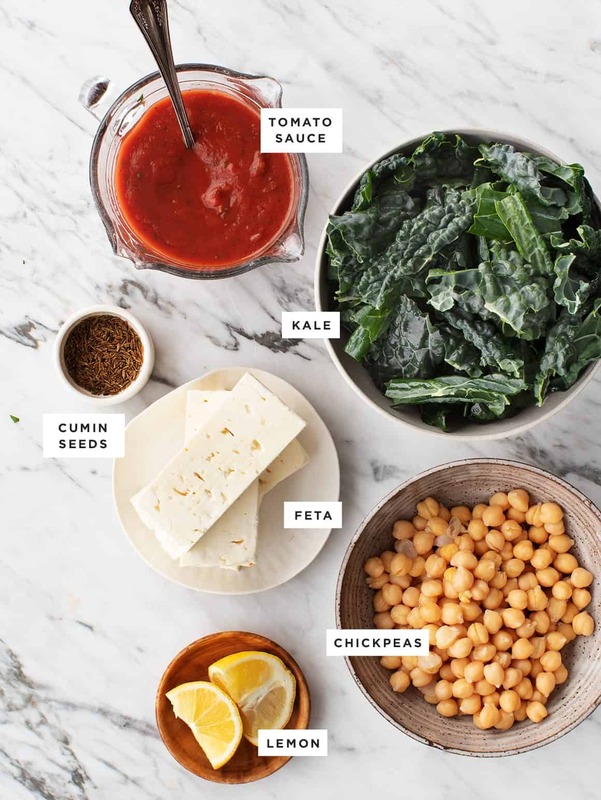 Kale, chickpeas, and feta- all three things I love and keep stocked at home. The only thing I need to grab is some fresh cumin. Can’t wait try it out! Do you have any nutritional values on any of these recipes? Substituting with white beans and spinach for dinner on Sunday. Sounds like a good combo, I hope you enjoyed it! Love kale. I am going try the feta kale chickpeas. Sounds good and different. Could I sub ground cumin for the cumin seeds? This looks so great, can’t wait to try it! Yes and how much ground cumin? I just bought some and want to try it! 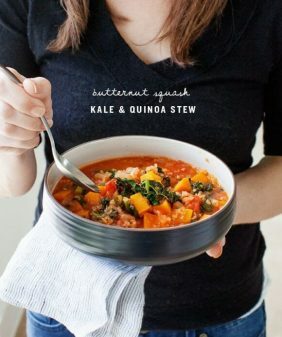 I would try 1/2 teaspoon ground cumin, but I’d stir it in with the tomatoes so it doesn’t burn to the pan while the kale cooks. Let me know if that helps! Just made this tonight for book group. It was a hit! I used 1 1/2 teaspoons of ground cumin but be careful it doesn’t burn. I also put in a 2 inch piece of kombu to take the gas out of the chickpeas while simmering. I removed the kombu after about 15 min. I only had crumbled organic low fat feta and sprinkled that on top of the dish and it was delish. Hi Brian, I’m so glad you loved it! How necessary is the lemon juice? I’m allergic to citrus. I’m hoping it’ll be okay to just leave it out. I’ve also had trouble digesting lot of chickpeas in the past so I thought I’d dilute them down a bit with some caramelized mushrooms and onions. Hopefully I’m on the right track here – am trying it later this week. Hi Cyleste, you can leave out the lemon juice, it’ll be fine with out it. I think your idea of onions and mushrooms sounds delicious, let me know how it goes! We made this last night with several changes; partly because I have a lot of food issues, and partly just for fun. For starters, we didn’t use any lemon juice (allergy). Then I misunderstood the recipe and we used marinara sauce instead of tomato sauce. I’ll use tomato sauce next time. We started with some caramelized mushrooms and onions. Normally I can eat that stuff like candy, but I really don’t think it was necessary. The dish has so much natural umami on its own – it really didnt need it. We also used half kale and half spinach – it was perfect for me, though hubby wants more spinach next time because he doesn’t like kale. Finally we used 2/3 chickpeas and 1/3 white beans. I loved that addition so much! Hi Cyleste, I’m so glad you had fun with the recipe! Sounds delicious! This is so delicious! I didn’t have a lemon so I used balsamic vinegar, and I love tomato so I used 3 cups of the homemade sauce. My whole family (OK, not the 4-year-old) loved it! Thank you. This was really good! I’m a non-vegetarian (I am actually a butcher by profession) with a meat-and-potatoes-and-pizza boyfriend and we both just gobbled this up. All I had was a can of plain crushed tomatoes, so sauteed some onion and garlic before adding the kale, and I used little half-inch cubes of feta instead of feta steaks because that’s what I had in my fridge, but otherwise made the recipe as is. It’s really, really good. 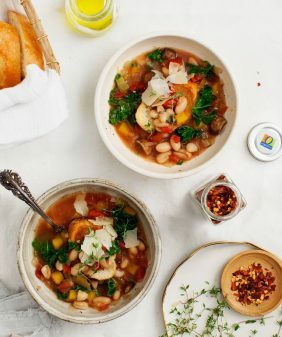 Hearty and tangy and inexpensive. Will add this to my dinner rotation for sure, especially if I keep getting lacinato kale in my veggie CSA. Even my chihuahua ate a few chickpeCD! One of your most inspiring posts, thank you! I made this tonight, using just 6 0z of cheese. My entire family loved it! The kids liked that they could choose to eat the dish as a sandwich or do “dippies”. Hi Sarah, I’m so glad everyone loved it so much! Hi Jeanine Donofrio. i am a big lover of food specially this type of food. when i read this blog i loved it and it try friends of pho restaurant they told me thanks for giving this information. So any body can visit this website. thank you. Hi Jeanine Donofrio. i am a big lover of food specially this type of food. when i read this blog i loved it and i told it friends of pho restaurant they told me thanks for giving this information. So any body can visit this website. thank you. Made this tonight and loved it! Wouldn’t change a thing, so delicious! So simple. So delicious. I made it with the 3 cups of sauce, because we like it saucy, and it was delicious! Do you have nutrition information for your recipes? I like the style of writing on your blog. As a new food blogger, I can not thank you enough for your encouraging and constructive advice. Your blog is an archetype of good taste…in more ways than one. I wish you endless joy and hope that you continue to share your beautiful life in foodie heaven with us all! NUM! I made this for dinner last night and it was so simple and delicious! Yay! So glad you loved it! This was AMAZING! The whole family loved it. I made the tomato sauce recipe linked to the recipe but modified it a little by substituting butter for the olive oil (and used a bit more than I should have!). That sauce really makes the dish so be sure you use one that you love. I am so excited that I found your blog – I will definitely be making more of your yummy recipes! Hi Kim, I’m so glad the whole family loved it! And welcome – I hope you enjoy the other recipes! It is very good. Its look so delicious. Your chickpeas is perfect. I will definitely this try. Thanks for sharing your post.